Create a line drawing in paint on a large sheet of watercolour paper or lining paper (A1 or larger). 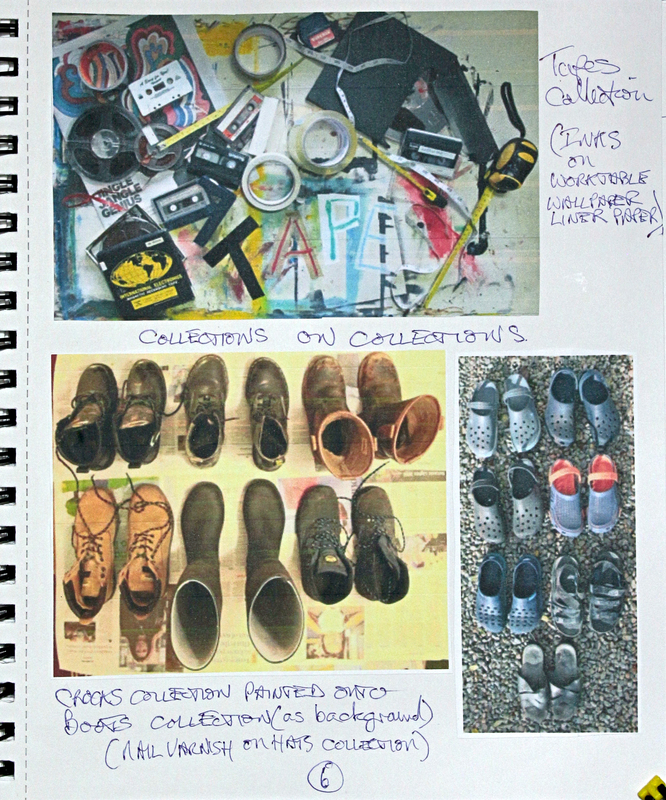 Choose another one of your collections to paint using any of the materials listed in Exercise 2.1 or acrylics, watercolours or inks. You don’t have to paint the whole of the background colour in unless you want to. My drawing table is always covered with a wallpaper liner paper so that I can keep the table surface clean. In thinking about this exercise it seemed appropriate to make use of the most recent lining paper – I usually just burn these once they become too covered in splashes and over-runs of paints before replacing them. In this instance I cut the messy lining paper to an approximate A1 size. I forgot to photograph the liner paper background to this exercise, but you will get an idea of this from the image above, and I believe you can still see the marks and shapes of the backing lining paper showing through the painting (below). For this exercise, inks seemed to me to be the most appropriate medium, so I used coloured inks applied with the wooden tip of a brush and PITT ink pens to paint my line painting. The various tapes of my collection were a selection of measuring tapes, packaging tapes, masking tape, cassette music tapes and reel-to-reel tapes. After sketching the lines and shapes onto the wallpaper lining paper with a graphite pencil I painted out the outlines and filled in the shapes using the wooden end of a small paintbrush to mark in the inks (no brush hairs were damaged in the painting of this image). 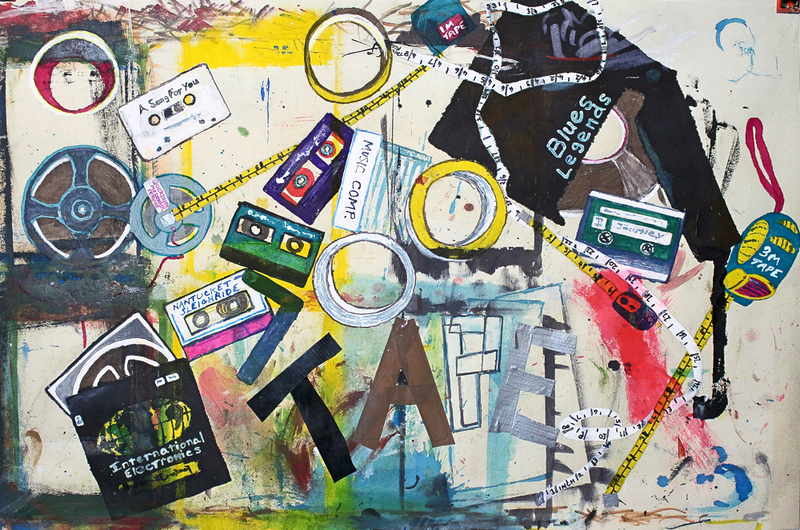 This picture represents my connection to using measuring and packaging tapes in my current artistic work, and also my connection to music tapes from cassette to reel-to-reel. Most of my music tapes have now been converted to MP3 computer files, but I still have the original tape collections.